The patent pending SpillX fueling system has been designed to bring locomotive fueling into the 21st century. 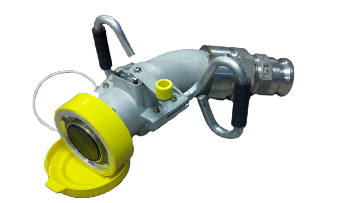 Leveraging proven aviation fueling technology, SpillX uses a dry break connection between the nozzle and the locomotive to ensure that no spillage occurs before, during, or after fueling operations. This system significantly increases safety by not allowing the nozzle to be opened until connected to a locomotive. Likewise while fueling, the nozzle cannot be disengaged from the locomotive until the nozzle has been closed and flow has stopped. The nozzle features a built-in safety lever on the nozzle. The nozzle must be properly connected to the locomotive and the poppet activation lever engaged, to allow the flow of fuel into the tank. During the fueling process, the nozzle cannot be disconnected accidentially from the locomotive. It is only after the engagement lever has been closed and the fueling process stopped, that the nozzle may be removed. The amount of fluid remaining between the two dry break poppet surfaces at disconnect is less than 1.5 cc's. The SpillX receiver is installed in the fill port of the locomotive and provides the connection point for the SpillX nozzle. The connection uses a military specified MS 24484 dry-break sealed poppet connection. With the poppet closed, fuel is unable to back flow out of the receiver -- helping to ensure that fuel is kept in the tank. This dry break connection helps prevent fuel theft and foreign objects from being dropped in the tanks. It also eliminates potential spillage of fuel from the filler neck in the event a locomotive would overturn in a derailment. The lower portion of the receiver also serves as the internal shut off mechanism to stop the flow of fuel into the tank once the full level has been reached. 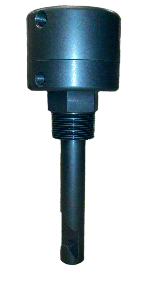 Through the use of hydraulic action, the shut off event occurs gradually over a period of 4 to 6 seconds, which eliminates problematic "fluid hammer" effect. The SpillX jet level is installed into the existing tank fitting at each fueling port. This hydraulic mechanism determines when the tank has reached a full level. Once the tank has reached the full level, no additional fuel can be placed into the tank. The jet level cannot be overriden or bypassed.